Easy coconut truffles recipe with chocolate. 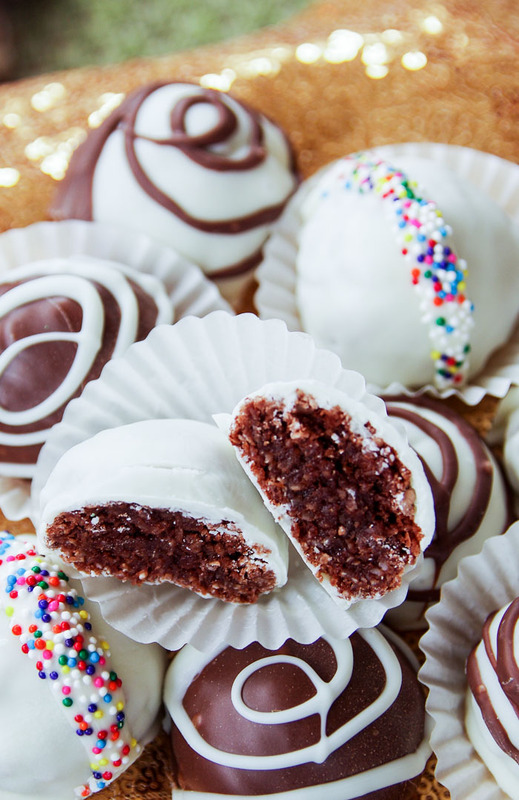 In the world of desserts, a “truffle” is a round chocolate confectionary beloved by many, but did you know it is actually a copycat? Those chocolate delights were created to imitate the real deal – a spore filled body of a fungus found near old trees. How appetizing, right? 🙂 Similar to a mushroom, but much, much more rare, edible truffles found in the wild are nicknamed by chefs as the “diamond of the kitchen” because they have a revered flavor when the spores are mature. Each truffle has its own unique taste. The black truffle, for example, has a rich, syrupy sweet flavor and that my friends, is how the copycat truffle came about! Typically coated or dusted in chocolate, truffles can be filled with anything from caramel to creams to nuts. When I stumbled upon a recipe in the February 2012 issue of Good Housekeeping Magazine for truffles made with coconut, I just had to make them! I love coconut. The recipe calls for three cups of finely shredded coconut, quality cocoa powder, bittersweet chocolate and vanilla. To me, the filling has to be the most delicious part of the truffle and I’m glad to say that this recipe did not disappoint! 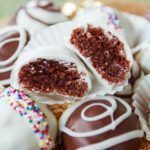 I have made these coconut truffles for birthday gifts, Christmas parties and Bible studies and they are always memorable. I actually had a friend take one home for the freezer and said she broke off a tiny piece each day for a week so it would last! These coconut truffles are quick and simple to make, extremely delectable and they can be decorated for any occasion. Since it’s almost St. Patrick’s Day, I’m going to give them an Irish twist. Are you ready to make some homemade coconut truffles with me? 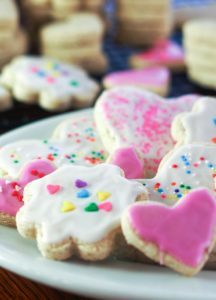 The most important part in making these is to be sure you have three cups of finely grated unsweetened coconut. 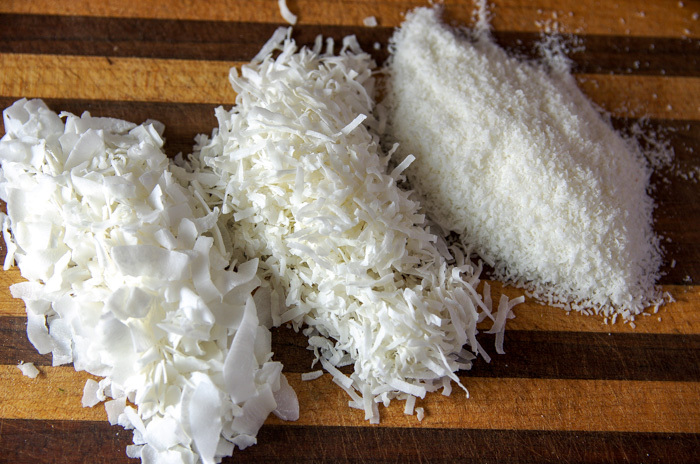 Here is a picture of flaked, shredded and finely grated coconut. You can make any form of coconut into finely grated by using a blender or food processor. 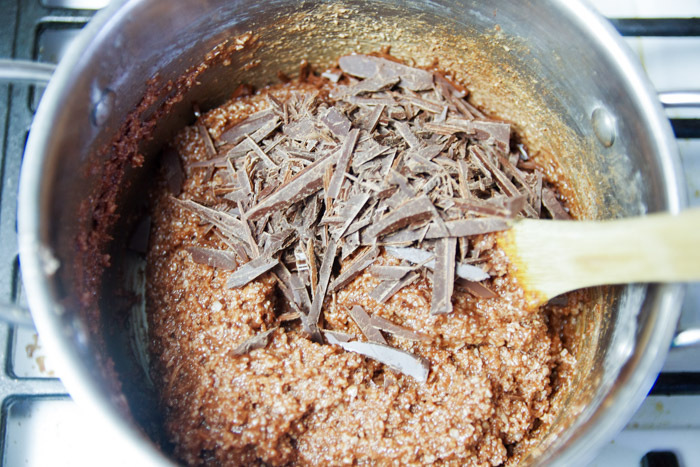 Into your bowl of finely grated coconut, add 3 Tablespoons of white flour and 3 Tablespoons of quality cocoa powder. 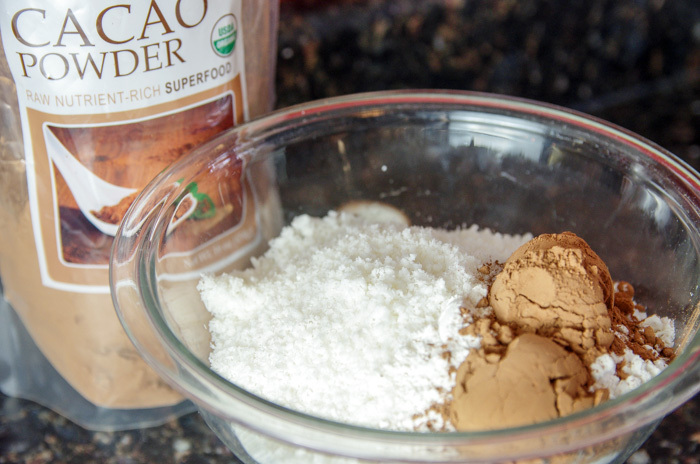 I recommend using raw cocao powder because of its potent chocolate flavor. You might not have as rich of a truffle if you use say, and old jar of Hershey’s, but it will still work! 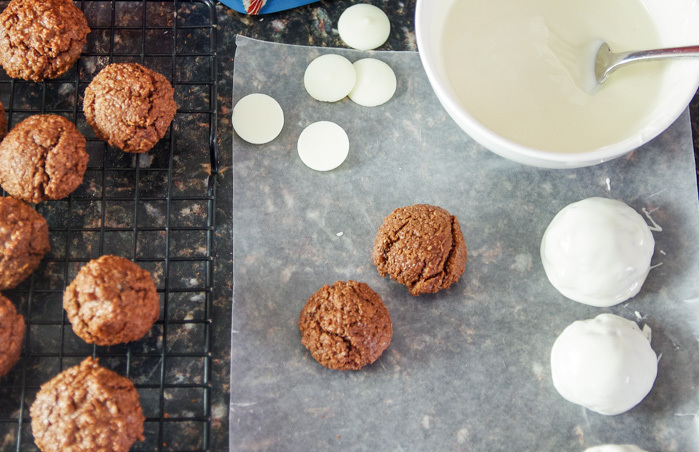 Set your bowl of coconut and flour mixture aside and begin separating four eggs. The recipe calls for four egg whites. You can either discard the yolks or save them for a yummy omelet later! Before we start cooking, there is one more step in our prep work. Using a sharp knife, chop 3 oz. of bittersweet chocolate (60% or more cocoa) which equals about 1/3 cup. Most baking bars come in 4 oz sizes and break into 8 squares, so I chopped up 6 total squares and set it aside. Time to turn up the heat! In a medium saucepan, mix the egg whites, 1 1/2 cups granulated sugar and 1/4 tsp. 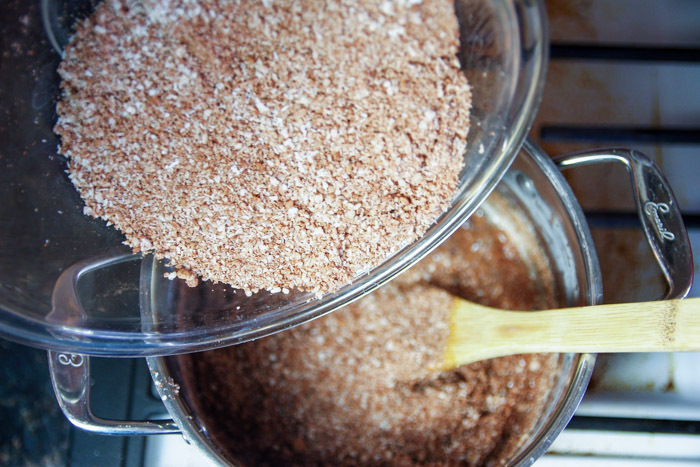 salt using medium low heat until the mixture is warm to the touch. Add your bowl of coconut and flour to the pan and continue stirring for several minutes until you hear a sizzling sound. Remove from heat and add 1/2 tsp. pure vanilla extract and your chopped bittersweet chocolate. 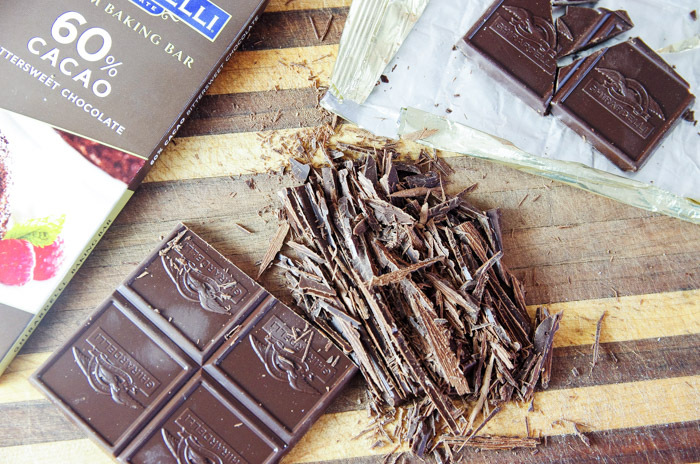 Stir until the chocolate is all melted. The dough will be thick! 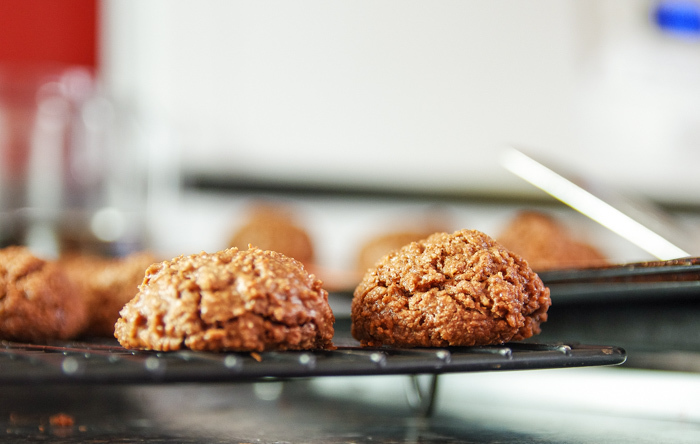 Scoop out small balls onto a greased or silicon lined baking sheet. 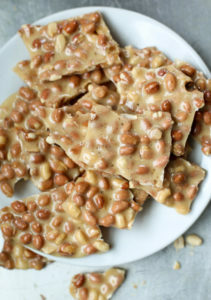 Bake them at 350 degrees for 15 minutes or until they are set and crisp around the edges. Remove from the pan and cool on wire racks. 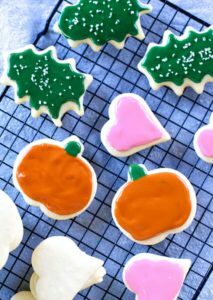 One tip I learned is that if you let your dough cool for 5 minutes, you can more easily form the dough into balls with your hand instead of using a cookie scoop. The ball shape will bake into a higher truffle (as seen on the right) The first batch I showed you was scooped out right away from the pan and did not have as much lift (left). When the truffles are cool to the touch, I like to dip them entirely in melted chocolate! 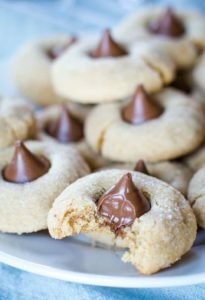 The original recipe asks you to dip only the tops with chocolate, but I think it’s more fun biting into something when you don’t know what’s inside! In honor of St. Patrick’s Day, I painted green chocolate shamrocks on some of them and swirled others with milk or white chocolate. To make things really fun, I drizzled a thick line of white chocolate on top of the already dried shell and added sprinkles for a rainbow effect! Be creative! 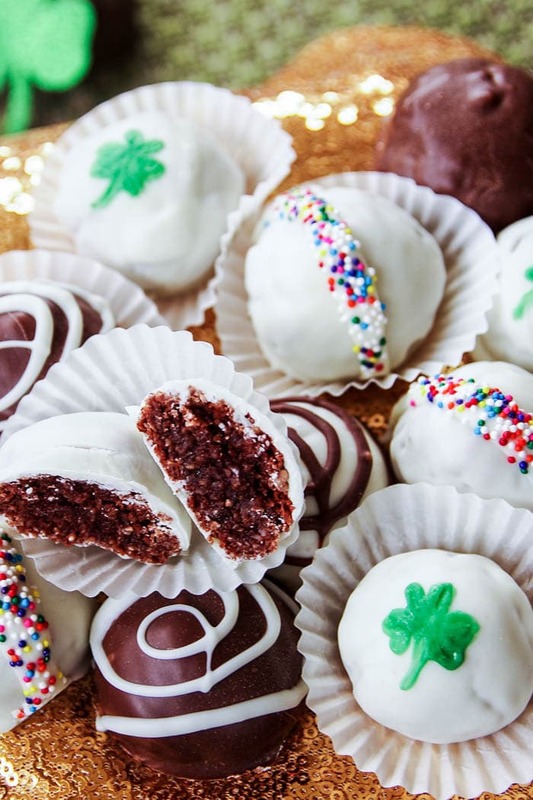 There is so much can you do to decorate these truffles. I don’t know about you, but if there was a pot of these at the end of the rainbow, I would kiss that leprechaun! Enjoy …and Happy St. Paddy’s Day! Preheat your oven to 35o degrees. In a medium bowl, combine 3 cups of finely grated coconut, 3 Tablespoons of white flour and 3 Tablespoons of quality cocoa powder. Set the bowl aside. Separate four eggs. Set the whites aside. Using a knife, chop 3 oz. of bittersweet chocolate (60% or more cocoa) and set aside. 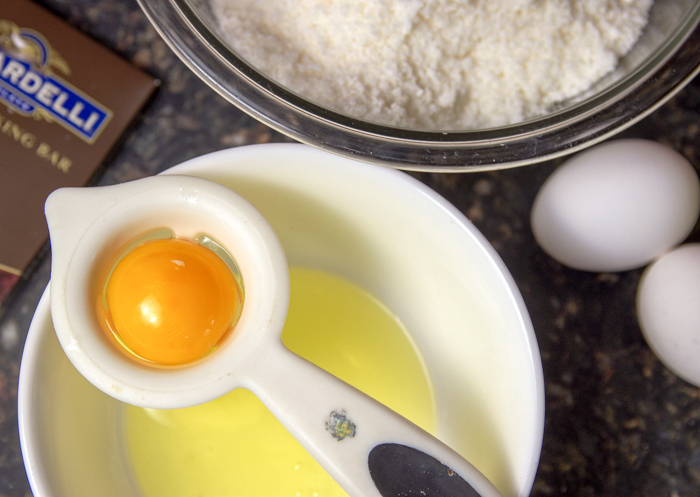 In a medium saucepan, mix the egg whites, 1 1/2 cups granulated sugar and 1/4 tsp. salt using low to medium heat until the mixture is warm to the touch. Remove from heat and add 1/2 tsp. pure vanilla extract and your chopped bittersweet chocolate. Stir until the chocolate is all melted. 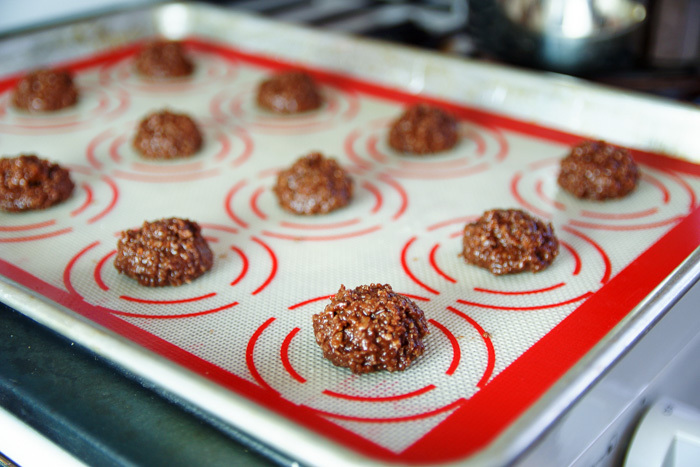 Wait 5 minutes and form the dough into balls with your hands and place them on to a greased or silicon lined baking sheet. Bake them at 350 degrees for 15 minutes or until they are set and crisp around the edges. Remove from the pan and cool completely on wire racks. Your truffles are so pretty. I could eat the whole batch to myself. I love anything with coconut! YUM! I love coconut too! These look like a perfectly decadent little treat! Great idea to decorate them for St. Patrick’s Day.